The Pre-Trip has sold out. Stay in the heart of Center City of Philadelphia at the Hilton Garden Inn. 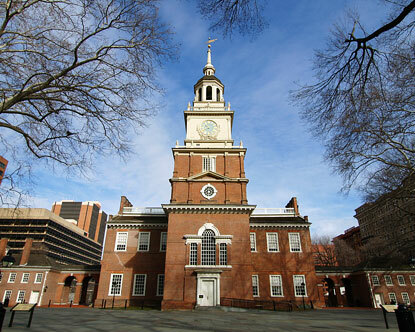 Experience attractions in Philadelphia that are historical, cultural, interesting, and unique. Philly provides an exciting blend of education and entertainment, making it a great pre-trip getaway for our attendees. There is so much more to Philly than the Liberty Bell and Independence Hall. Sightseeing in Philadelphia can be centered on colonial history, but there is so much more to learn and do in the birthplace of America. Our tour guides will bring Philly to life through walking tours, a variety of museums, such as Philadelphia Museum of Art, architecture, and Jewish History. Many of the top Philadelphia tourist attractions are historical in nature, but nature itself is an important part of the city. The parkway, where several of the museums are located, and Fairmount Park, along the Schuylkill River and beyond are filled with fountains, outdoor art, sculptures, and gardens. Don’t forget these famous things at the Philadelphia Museum of Art, the PMA’s steps and Rocky’s Statue! Check in at hotel at Hilton Garden Inn Philadelphia Center City @ 1100 Arch St, Philadelphia, PA between 4:00pm and 6:00pm. This hotel is in the heart of town and is just across from the convention center. 6:00 pm Dinner – In Chinatown, which is only a couple blocks away from the hotel, we will eat at New Harmony Vegetarian Restaurant (Kosher Chinese). 9:30am: Meet downstairs in lobby to depart for the day. Discover works of art at one of the largest and most renowned museums in the country. The Philadelphia Museum of Art is known not only for its majestic 1920’s neoclassical building atop the steps, made famous in the movie Rocky, but also for its superb art collection and special exhibits, as well as surprising permanent Asian and Medieval European installations. Art Museum admission includes The Perlman Building and The Rodin (if time allows). ***Highly recommended: Discovering the Impressionists, a special exhibit, with timed tickets, costs $5 in addition to entrance fee. This must be booked by you on your own, in advance, to assure availability. Book your ticket for the 2:30 slot. PMA is the only US stop for this exhibit. Did you know Jewish history and Philadelphia history intersect greatly? Find out how by going on a two hour/approx. 2 mile walking tour of Philadelphia! This tour includes the historic sights of the city with Jewish history behind each stop. The tour emphasizes the colonial aspects of Philly including stops at Mikveh Israel Synagogue (Founded in the 1740s. ), Elfreth's Alley (America’s Oldest Residential Neighborhood and was the Jewish neighborhood in the 1700's), Franklin Court (site of the brick home of Benjamin Franklin) and a walk by Independence Hall and Congress Hall. Option D2 for Dinner: Non-Kosher Jim’s Steaks South St. @ 400 South Street: Then catch some ice cream down the block. Check out of rooms by 9am. Bring all luggage packed and moved into designated room before heading out for the day. You will be able to pick your luggage back up after 1pm. Then head out to do tours for the morning. Breakfast will be on the run during the morning. See the Sights in Wheeled Fashion! Ride a 9 mile loop bike ride from boathouse row, along the Schuylkill River to view numerous sculptures view the sculling boats, and explore a part of Fairmount Park, of one of the largest urban parks in the world. We plan to continue up a one-block-long uphill piece away from the river to view where in 1876, there was the Centennial Fair and Civil War Heroes Memorial, with its wide concourses and Centennial Hall/Memorial Hall (now housing The Please Touch Museum), then on to Shofuso Japanese House and Garden. The gardens are open to the public for free. If there’s time, a tour or look-see of the Japanese House (socks only) is available. Cosmic Café is next door for breakfast. $7 Adult / $5 Senior for the Shofuso Japanese Garden. Philadelphia is the “mural capital” of the USA, with more murals than any other city. It’s the city’s larger-than-life art gallery. You can now explore the stories behind some of Philadelphia’s world-famous murals like never before. The Mural Mile represents 17 Center City murals that demonstrate the diversity of styles and subject matter that makes the City of Murals – and Philadelphia’s neighborhoods – so dynamic and interesting. Using provided map, you can experience the Mural Mile on your own using your cell phone or the downloadable podcast. This is a 2.5 mile walk that will take about two hours to complete. There is a shorter version available if wanted. Experience the transformation of Philadelphia from an engine of industry to a 21st century capital of business and culture. This 2-hour tour explores Philadelphia's diverse range of architectural styles and building technologies from the 1860s to the present, detailing the social, economic, and political forces that shaped the modern cityscape. Highlights include the spectacular Victorian interior of the Pennsylvania Academy of Fine Art (PAFA); the soaring central court of Philadelphia's first department store, Wanamaker's; and the atrium of the Comcast Center, Pennsylvania's tallest sky scraper. 2:00pm - Leave Hotel in Vans and head to camp to continue our adventure at the main event. Note: If you are planning on attending all three events (Pre-Trip in Philly, Main Event at Camp JRF and Post-Trip on the Delaware) PLEASE contact us at Event@MosaicOutdoor.org BEFORE booking any flights. 1001 Filbert Street, Philadelphia, Pennsylvania 19107. This is one and half block away from the hotel. It is approx. $7.50 (rates vary) / 2 Hrs. from NYC to PA or approx. $18 (rate vary) / 3 Hrs. from DC to PA.
30th Street Train station (PHL) (From New York Penn station is approx. $54 (rates vary), Travel time 1.6 Hrs.). From 30th Street Station take SEPTA to Jefferson (Market East) Station or TAXI. By way of SEPTA: Take the Northeast Corridor Line to Trenton. Transfer to SEPTA to Jefferson (Market East) Station. Cost NYC to PA $15.50 & Travel time approx. 2.5 Hrs. Arrive by 3pm on Tuesday September 1st, 2015. This will get you to the hotel in time to check in and get to dinner. We will be taking a mix of 15 passenger vans and private cars. If you are driving and willing to take on passengers, let us know. Compensation is available. Note: Hotel rooms at the Hilton Garden Inn will be held for us until Wednesday August 5th. After August 5th we cannot guarantee a room but will see if we can help you. If you are trying to register for the Pre-Trip after August 5th please contact us at Pre-Trip@MosaicOutdoor.org to see if can accommodate you before doing so. Also Note that parking in Central Philadelphia is not cheap. Expect to pay $30+ per day for parking in central Philadelphia.